The Wellesley Theatre Project presented an entertaining, magical version of Shakespeare’s “A Midsummer Night’s Dream” (adapted by Diane Timmerman) on November 16–18 at the Wellesley Community Center’s intimate Studio Theater. The play is set in the forest and revolves around several versions of love: the pending marriages of Duke Theseus and Queen Hippolyta and Demetrius and Hermia, the love shared by Lysander and Hermia, the unrequited love of Helena for Demetrius, and the relationship between Oberon and Titania, King and Queen of the Fairies. Once King Oberon and Puck cook up a plot to bolster selected relationships with the use of a magical flower, and Puck makes some mistakes in the execution, the relationships are realigned, with farcical consequences. The Wellesley Theatre Project’s set conveyed the sense of a fantastical dream, with rows of tissue-paper leaves in multiple shades of green hanging from the ceiling, lighting that suggested the shadows of tree branches and leaves, and a spare middle section with a row of four columns that opened into an alternate configuration. Simple, lilting music gently welcomed the audience to the theater and put them in the mood for the adventures ahead. The actors ranged from ranged in age from 11 years to 14 years. They delivered Shakespeare’s iambic pentameter with ease and the nuance of conversational speech, not of stilted language. They moved well around the stage in ambitious blockings, and also excelled in physical comedy. The makeup artists and the costume designer created an other-worldly, dream version of the fairy kingdom, with intense blue, green, and pink makeup, a regal gold gown for Titania, and beautiful wings for the fairies. Tessa Baron, as Hermia, brought a mature expression of loving emotions to her role, but also a convincing anger when her love relationship was complicated by Puck. Nate Madden, as Lysander, delivered his flowery love speeches with passion. Joey Lepre, as Demetrius, made forceful denials of love to Helena and then later showered her with absolute devotion. 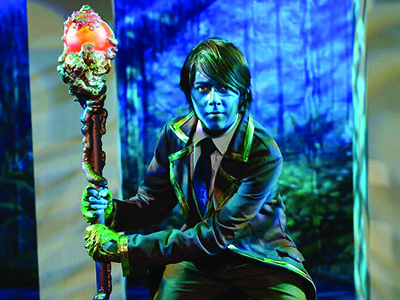 Chloe Chao, as Helena, portrayed the despair of unrequited love and imbued each of her lines with complex, realistic feeling and clear expression. Bottom was well played by Connor Federico-Grome. He stomped around the stage, demanding attention, and overplaying his lines, as the character was written. He wrung all of the comedy he could out of Pyramus’ death scene, with excellent timing, and the audience loved it. Leah Steinman played Queen Titania well with saucy confidence and authority, and she delivered her comedic lines with skill. The Wellesley Theatre Project’s staff has done fine work with the talented students in their charge. 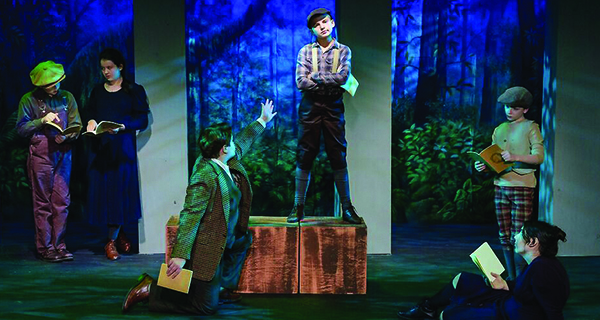 This play was a great beginning to their 2018–2019 season, which will also include “The 25th Annual Putnam County Spelling Bee,” “The Little Mermaid,” and “Mary Poppins,” as well as several other selections. For more information, visit www.wellesleytheatreproject.org.